Has your cat stopped using its litterbox consistently? Litterbox problems are the number one reason that millions of cats are turned into animal shelters every year. Check out these tips to help your cat succeed and stay in his forever home! Rule out a medical condition! Urinary tract infections or bladder stones are just a few of the treatable medical conditions that can contribute to a cat’s unwillingness to use a litterbox. Allowing a medical condition to go untreated can make a simple problem into a more complicated one. Increase the number of litterboxes in your home. The general rule is to have as many litterboxes as you have cats, plus one. For example, if you have two cats, you should have 3 litterboxes. Make sure your litterboxes are large enough for your cat. Many commercial litterboxes aren’t large enough for the average cat. Your cat should be able to climb all the way in and turn around comfortably. You may want to consider using a modified Tupperware-type container instead of a traditional litter pan. Clean the litterbox daily. Many cats won’t tolerate a dirty box. Litter should be scooped daily and changed completely at least weekly. More cats means cleaning the box more frequently. Make sure your litterboxes aren’t in a “scary” place, like next to a washing machine or air conditioner that may make a lot of noise. If possible, have one litterbox per floor of your house. This is especially important in very young, old or ill animals, as they may not be able to make it to the box if it is far away when they realize they need to go. If accidents have already occurred, regular cleaning products won’t suffice. You’ll need a pet-specific cleaner to get the entire odor out. (Even if you think the area smells clean, it’s possible that your cat can still smell it.) A few good products are Nature’s Miracle and Anti-Icky-Poo, but there are many available in your local pet supply shop. You can use a black light to check for accidents you may have missed. Cat urine will glow under black light, making it easy to know just where to clean! If your cat is still urinating in the same area after you’ve taken all of the above steps, consider using an aversive to make the area less desirable. You can try placing heavy plastic carpet runner with the pointy side up, covering the area in a thin layer of tin foil, or placing double sided tape in the area. Try to reduce your cat’s stress level. (Yes, animals get stressed, too!) Be sure she has quiet, safe places to retreat if she desires them. 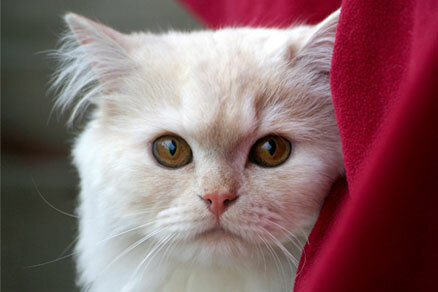 You can also use Feliway – a calming cat pheromone which has been proven to promote feelings of well-being in cats. There are also collars infused with this pheromone which ensure that your cat gets a constant calming cue (one name brand is “Good Behavior”). Thank you for visiting the Educational Corner. Please check back often for future articles or like us on Facebook to be notified of future articles. Have any topics you would like to learn about? E-mail info@BethelParkAnimalClinic with the topic you're interested in and we'll post articles with the most popular topics.